There are 3118 posts in this topic. You are on page 2 of 63. Now the real interesting part would be if it would extract images to a workable format for modification. Pull out a range of frames and do some modification, reinsert. I hope Stern don't put a stop to this. Shoot to Thrill as attract music alone would be awesome. This would also be handy for security. A custom image at startup to identify the machine as yours if it was ever stolen (out on site perhaps?). I have modified my AC/DC browser. It can now browse all the images that can be displayed on the dot matrix. 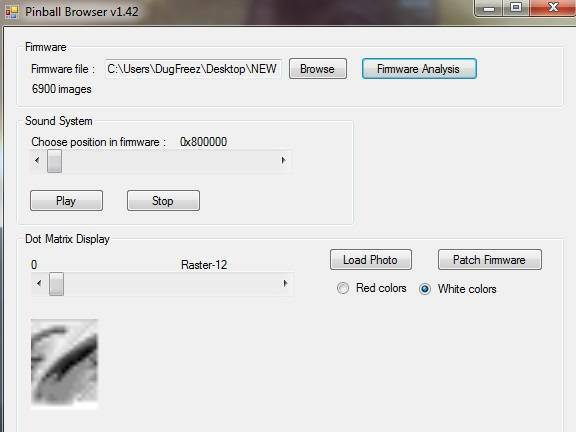 Select your firmware and click on "Firmware analysis". 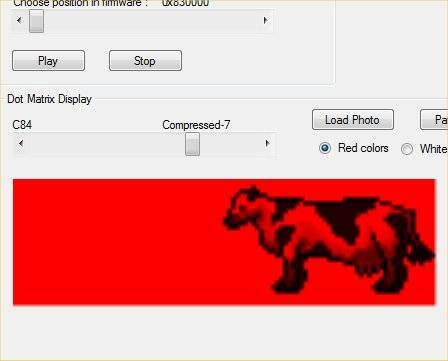 You can modify all "Raster-12" images (the type is displayed above the scrollbar). For other types, you are limited by the free available space in the firmware. As I only have an AC/DC pinball, I didn't test the patch for real on other pinballs. Let me know how it works on your pinball ! To begin, I suggest you modify the Stern logo that scrolls when the pinball is idle (just after the high scores). When you flash the patched firmware, it will end with a message saying that there was a problem (because of a bad file crc). Anyway, it works. ...but crashes on Spider-Man 2.6 rom. "Unknown Firmware!" Fixed. Link for new version updated in first post. Good Stuff. Now we don't have to "hurry up and wait" on stern to find out what is and what isn't on the code. Great work, this program is amazing. Metallica 1.06 works fine, I just loaded it. What doesn't work for you the audio or the DMD display images? Yes, a very cool tool for sure. Metallica Pro 1.05 works 1.06 does not. Can someone please email me the program if it's small enough? I can't access it at work, blocked site :/ Need something to do. Been playing around with this and trying to replace the Stern logo with a jpeg. No matter how small the image is (I went down to a 40x40 icon, just to test) and it says there is no free space with every image I try. Steve Richie yells, "Fire at will....and I'm not Will." Who will be the first to re-theme a Stern using this? There might be no room at all on the one you are trying, or the app doesn't know where to place it. Anyway, it should work on any Raster-12 image. On which pinball ?There might be no room at all on the one you are trying, or the app doesn't know where to place it.Anyway, it should work on any Raster-12 image. 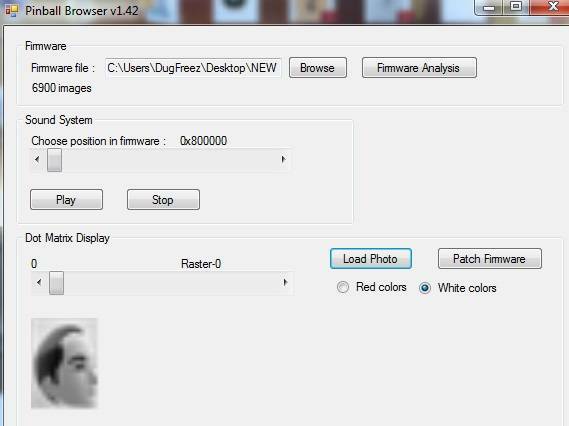 Same firmware version you are using in your OP that you replaced with the girls face . Does the JPEG have to be using a certain type of compression/size? Does the image have to be converted before hand? The lowest size JPEG I used was a very small 40x40 icon. The highest was around 400x400. Regarding the image format, there is no requirement : it will be resized to the correct size and converted to gray scale. You can also use other formats that JPEG (bmp, png, ...). For raster-12 (mostly used for video), the new image is stored at the same place; so, there is no limitation in the number of images you can replace; for other types, the new image is stored in a free space (on AC/DC, you can replace around 5 images). Been exploring the TRON .bin. It seems like it is not getting a lot of the video clips in the game. The interesting thing is that it does show some unused video (Sam walking through the arcade and Sam getting blasted into the computer). I am not seeing any of the in-game video clips. Is it possible that this needs to be tweaked to see all of the missing TRON video? Was thinking maybe it's not detecting all the Tron video because most of it is not full screen and is instead only the right two thirds of the screen? 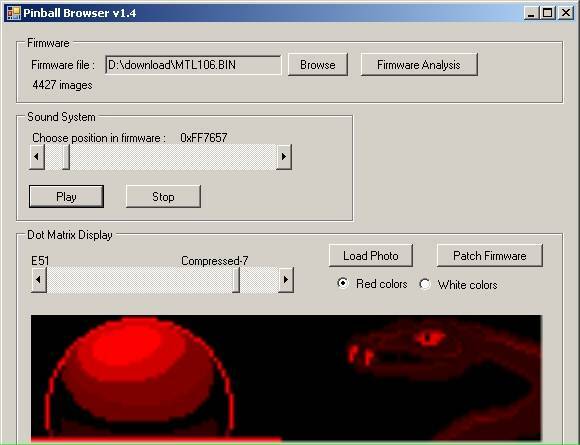 Can you tweak it to detect that kind of video also? Could you please take a photo of your DMD displaying an image you cannot find in the app ? It would be even better if this image is part of an animation. Did you have a better result with version 1.41 ? The format of your logo does not matter : it will be automatically converted (format, size, resolution and colors). You can replace any image you want : if the original image is raster-12, it will be modified 'in place', otherwise (raster-0, compressed-x) it will be moved to free memory (if available). On the screen shot, 4427 images are found. Please try v1.42 to see if this number increases. Would it be possible that this could support earlier SAM games? For example I was unable to get 24 or CSI loading up. Just curious, this is very cool. 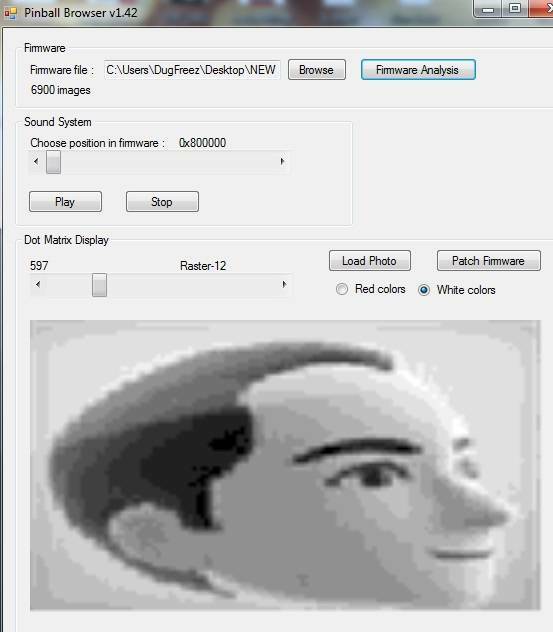 Yes, I could modify the images. Works great! Thank You! Doesn't work on a Mac? If there is no free memory available, how do we patch with a new image? Can we not delete the image that was there previously? Ok, i now realise that you cant add extra compressed-7 images into Tron 1.74.bin. I will try on the video section shortly. Has anybody else had their anti-virus software remove this app? My Symantec is identifying it at as a trojan virus SONAR.Heuristic. It quarantines then removes the file. Yes, but thats just a certain attribute your AV is flagging because its an unknown .exe. Its fine to use dont worry. oga83, any thoughts on export functions? So instead of having to do a "Print Screen" capture you could just pick a frame and copy or export it? Another nice and similar feature would be if you could select X frame through x frame to export as a .gif file or some other type of animation. Just something to think about. I'm really enjoying the program. I did play around with some patching (with mixed results) some images looked skewed when I reopened a patched ROM, but I haven't tried flashing any of them on my game yet. Thanks for the innovative work you have done so far. UPDATE: I was also just thinking if you could export the screen you are looking to replace, you would have a better idea of the size and ratio of the picture you should be choosing to patch in there. You wouldn't have to worry about the program "injecting" it and changing the aspect ratio or stretching it out. You would know what would work best in that location and get your picture ready before the program had to reshape / stretch / re-size it. That would be a nice feature. I'd like to take some of the animations that are currently active and replace them with some hidden animations instead. Has anyone tried some custom work on Tron or TF yet? Yep. Have you listened to all the unused voice calls in Tron? There are so many unused ones... it's almost like the majority of the ones on there are unused. I did play around with some patching (with mixed results) some images looked skewed when I reopened a patched ROM, but I haven't tried flashing any of them on my game yet. All images i try are like this on the patched ROM when i view them back in the browser. Perhaps because the browser will only let you upload .jpegs? When i try to upload any other format, it doesnt let me do so. All I get is static garbage on the pc at work when trying to listen to audio. maybe because it is using onboard audio. I can try at home later. oga83, any chance of getting the audio clips to play back at the correct speed? On Tron, some play really fast, some play just right, some play slow. I'm guessing it's different sample rates and the program needs to account for that. Ya seems like the music or sound effects play correctly, but voice clips sounds like alvin and the chipmunks. It its like watching Tron all over again if you just hold down the right arrow. Wow... TRON has a whole bunch of voice calls not used in the game. Many unused of the custom female game grid announcer. Many, many movie quotes not heard in the game. It's almost like there is EVERY single line spoken in the movie by Flynn, Sam, Castor/Zuse, CLU, and Quorra in here. Here is the description of the issue I have. Keep in mind that in all examples I have used the same picture (a 100 x 100 pixel 96 dpi 24 bit .jpeg). test 1 is of the pic just as I loaded it in the ROM and patched it. test 2 is what the pic looks like when I reload that patched ROM with the browser. test 3 is the same pic loaded to a different location on the ROM but when I just loaded it. test 4 is that same pic after I reloaded that patched ROM. I have a few questions. since the first smaller picture is skewed after being patched in on the browser...will it also be skewed (and looks as it does in the browser) if flashed to the game? What is making the small pic replacement skewed and the bigger one is fine? Is it the size? Is it because the small original pic was "Raster-0" and the bigger one was "Compressed-7"? The question is if the data is in the ROM along with the media.. so it just needs to be interpreted correctly.. or if that info is stored in with the game code. No trojan in it. To feel more comfortable, you can block it with your firewall (the app doesn't use network at all). Not yet, but I'm working hard on it. Sounds are far more complicated than images, and it will take more time than I first expected.